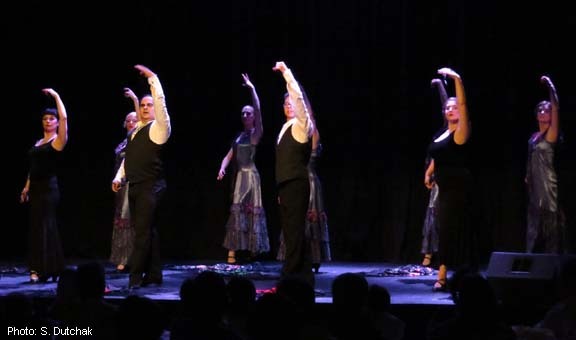 BOLERO DANCE THEATRE is a Winnipeg-based dance company committed to the artistry, beauty, and drama of Spanish dance. The company's repertoire ranges from dances featuring the passion of flamenco and spirit of folkdance to the grace of escuela bolera. The company's objective is to present dances in their authentic forms and also to showcase Spanish dance as an evolving art. Bolero Dance Theatre's company is comprised of about twelve dancers with varied backgrounds, from professional ballet training to recreational ballroom and folkdance. All have many years of Spanish dance training. The company has made several trips to Spain to study flamenco, classical Spanish dance, and escuela bolera. Admission to the company is by audition or on the invitation of the director. The company's season features one annual production of original choreography. Several past productions have been based on noted literary and artistic works, such as Blood Wedding and The House of Bernarda Alba, both by Federico Garcia Lorca, and an original version of Carmen. Storylines based on historical events have been developed for the company's productions Alhambra, Picasso, and Spartacus. Other suites have focused on noted Spanish figures, such as composer Isaac Albeniz and painter Francisco de Goya. Bolero Dance Theatre has performed extensively at private and public functions, appearing in Manitoba, North Dakota, South Dakota, Ontario, and Nova Scotia, at venues and events such as the Centennial Concert Hall with Winnipeg's Symphony Orchestra, the Emerson Theatre Festival, the Winnipeg Fringe Festival, Kenora's Harbourfest, Folklorama's Opening Ceremonies, and the XIIIth Pan American Games Opening Ceremonies. Performances can be booked through Folklorama Talent. Tickets now available for ZAMBRA ! 2017 BDT. Simple theme. Powered by Blogger.